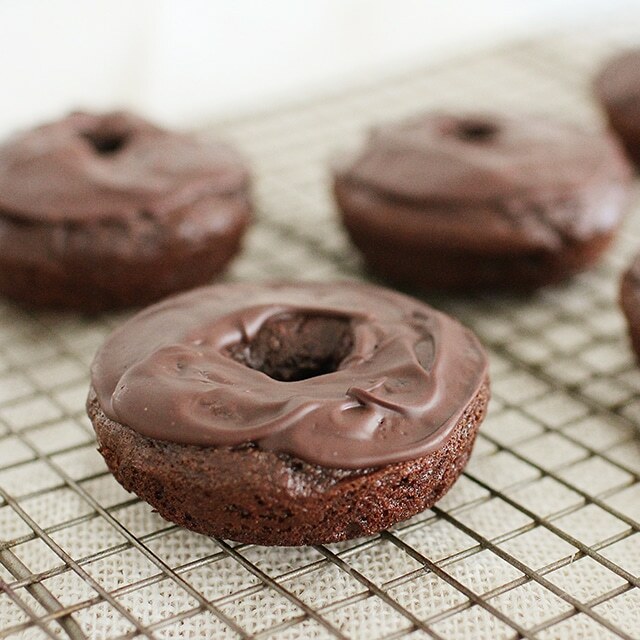 Make rich, chocolatey, homemade donuts right in your own kitchen! These donuts are baked, not fried, and even include a surprise ingredient to make them a more balanced treat. 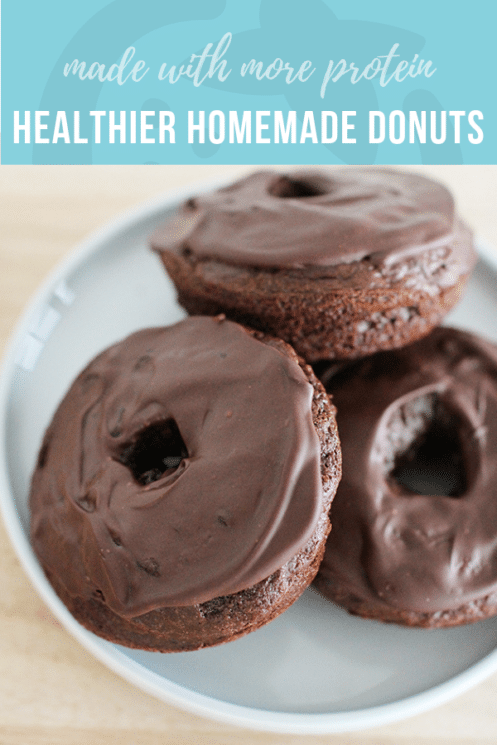 When we make treats like these homemade donuts at home, we get to enjoy fresher flavors and better nutrition– so important to us when we’re feeding our kids! 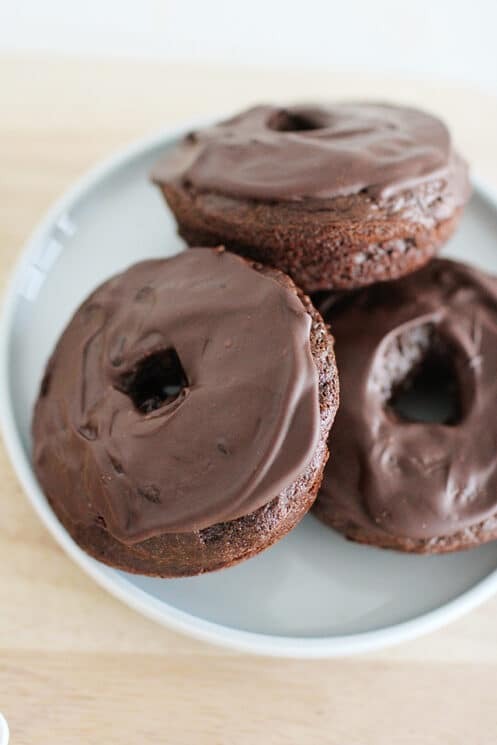 These chocolatey homemade donuts taste sweet and indulgent, and are topped with a thick, rich glaze made from two simple ingredients. Try them the next time you’re looking for a lightened-up dessert. What Makes These Homemade Donuts Healthier? Store-bought donuts lose nutrition points in a few major ways. First, they’re loaded with sugar. Second, their macro-nutrient profile is strongly skewed towards simple carbohydrates and processed oils. 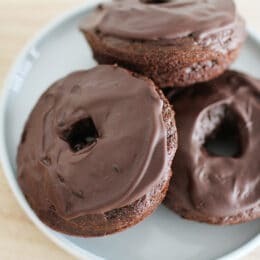 While these homemade donuts are still absolutely a treat food, they’re a healthier alternative to store-bought donuts for kids who love donuts. Have a bite! To cook up donuts in the signature shape, you’ll of course need to start with a donut pan. We love silicone because it’s so easy to pop the donuts right out. You can buy a cute pair of silicone donut pans here. Mix up the batter like you would for a cake: dry ingredients in one bowl, wet ingredients in another, then fold them together. When you’re filling the molds, make sure you only fill the batter 2/3 of the way up the mold, to account for rising in the oven. A couple tip about glazing the donuts: after your donuts come out of the oven, let them cool completely before you add the glaze. Then chill them to set the glaze, but not for too long. You’ll want to take them out of the fridge and eat them at room temperature. Preheat oven to 350 degrees F. Spray donut pan with cooking spray. In a medium bowl, add the egg, almond milk, Greek yogurt, honey, and vanilla. Whisk to fully combine. 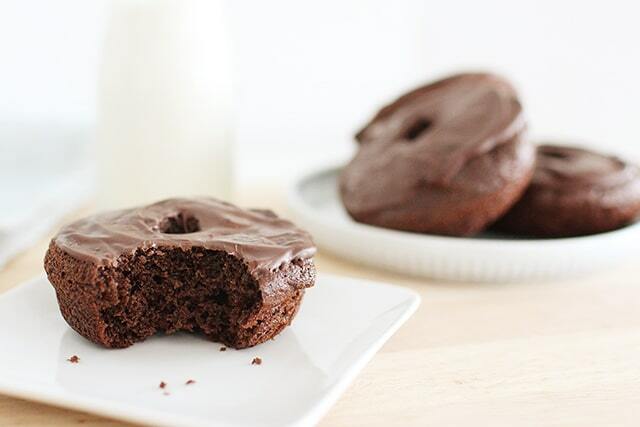 In a separate bowl, mix flour, protein powder, cocoa powder, baking powder, baking soda and salt. Mix together then add to wet ingredients. Stir together until fully combined. Scoop out by 2-3 tablespoons full, into the donut mold. This should fill each mold 2/3 full. 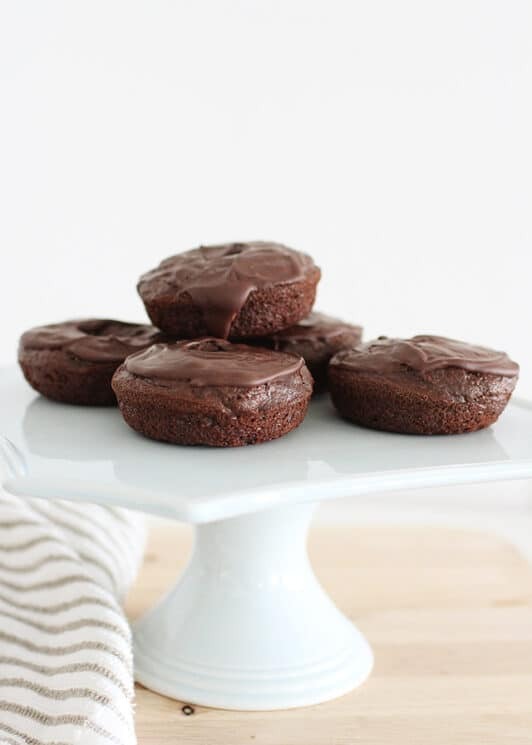 Mix chocolate chips with avocado oil in a microwave safe dish. Heat in the microwave in 30-second intervals, stirring each time. Once it is smooth, dip the top of each donut into he glaze and allow the excess to drip off. Chill in the refrigerator for 30 minutes to harden the glaze. Was wondering if there is something else to use instead of Greek yogurt ?? Hi Jessica, the yogurt in this recipe is important for the texture of the dough. I can’t think of a suitable substitute, though you could definitely try with a non-dairy yogurt. I want to make these over the weekend. Can you share what kind/type/brand of protein powder you use or what to look for in selecting one? It’s amazing how many carbs in a donut. Too much sugar for Children . Do you have to use cake flour with this recipe? Hi Brittany! I haven’t tried it myself, but I think you could substitute other types of wheat flour in this recipe and still have the donuts turn out. Wow! Your homemade donuts are really very delicious and healthy too. Thanks for sharing your recipe here.